We’re tossing more stuff, and bulk recyclers are dropping by the hundreds. Few states have a greener rep than California, and for good reason. The state has a cap-and-trade program for carbon emissions, solar-energy production exceeding that of all other states combined, and, at the behest of Gov. Jerry Brown, it’s now mulling new targets that would slash greenhouse gas emissions to 40 percent of 1990 levels by 2030. The state has proved itself a national leader in environmental policy. All of which makes California’s latest waste and recycling report, issued yearly by state Department of Resources Recycling and Recovery (CalRecycle), so bewildering. It reveals that landfill waste in the state jumped to 33.2 million tons in 2015, a one-year increase of 2 million tons, contributing to last year’s release of 200,000 extra metric tons of CO2 into the atmosphere. Per capita, each Californian now tosses 4.7 pounds of stuff into the landfill. The state’s rate of recycling also dropped to 47 percent in 2015. That’s the lowest rate since 2010, and the first time since the state began measuring that the number has gone below 50 percent—not the greatest news, given California’s 2020 goal of recycling 75 percent of all consumer waste. There are other elements at work, too. The low price of oil, combined with other plummeting commodity prices, has largely eliminated financial incentives for companies to use recycled materials. Thanks to cheap crude, points out Californians Against Waste, a Sacramento-based advocacy group, producers are using more petroleum-based plastics than before, and less (easily recycled) aluminum. A four-year decline in the prices manufacturers are willing to pay for recycled materials has proved deadly for many for-profit recycling centers. In part, that’s because it’s a subsidized business. CalRecycle pays up to half of the centers’ operating expenses, depending on the amount of materials they collect, to encourage recycling centers to accept plastic containers alongside the more lucrative aluminum cans. The deposits consumers pay on beverage containers provide an incentive for individuals and companies that do curbside pickup to bring cans and bottles to the centers (and pocket the deposits). But CalRecycle’s payments to the centers are based on scrap prices over the previous 12 months, with a three-month time lag. Which means, when prices are in decline, the payments come up short, and the centers struggle to stay profitable. 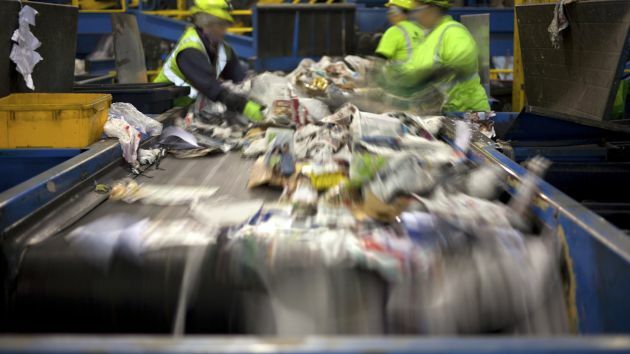 Statewide, the bulk recyclers have faced a cumulative shortfall of more than $50 million. Susan Collins, president of the Container Recycling Institute (CRI), says this has led to a rash of closures. Per her group’s estimates, more than 800 recycling centers have shut down in the past 16 months, unable to compete thanks to the low prices and insufficient subsidies. All told, nearly one-third of California’s recycling centers have gone out of business. CalRecycle’s Oldfield preaches patience. “I don’t think we thought it was going to be easy to begin with,” he says of the 2020 goal to recycle 75 percent of all consumer waste. “I don’t think we mind running the risk of criticism if we fall short of a number on a time scale.” He points to AB 939, California’s Integrated Waste Management Act. The 1989 legislation mandated that 50 percent of solid waste be diverted from landfills via recycling, composting, and incineration by 2000. That goal wasn’t achieved until 2006, but it now stands at 63 percent. As for the 75 percent number, which is not a mandate, CalRecycle is looking at new technologies it hopes will increase recycling rates for construction materials and organic matter, although there is no deadline for these developments. If the state is serious about reaching its goal, there is plenty of precedent. “We know exactly what needs to happen, it just isn’t happening,” Murray says. In the past, the state has set minimum standards for the amount of recycled content certain goods must contain. Newsprint must be 50 percent post-consumer materials; for glass containers, it’s 35 percent. Such standards also exist in California for electronics and paint.